Update 10:45 a.m. Tuesday: Traffic is now clear in both directions. 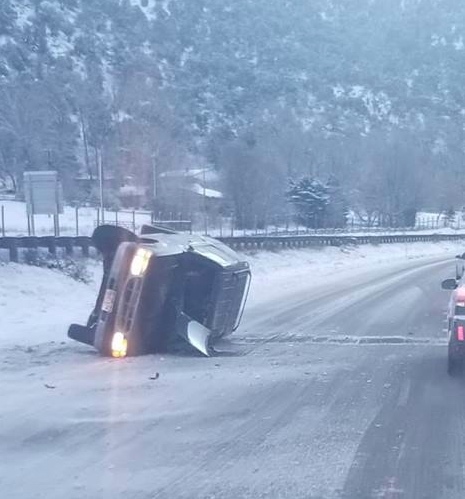 The Colorado State Patrol reports that the accident involved a single vehicle, a Ford Explorer, which spun out and rolled while eastbound on Interstate 70 near the Canyon Creek Exit 109 at 7:24 a.m. The 17-year-old driver and two occupants were taken to Valley View Hospital as precautionary measure, but no serious injuries were reported, according to Trooper Gary Cutler, PIO for the State Patrol. Traffic on I-70 eastbound was backed up this morning, as of 8:15 a.m., from Canyon Creek to New Castle’s exit 105 due to a rollover accident and slick roads. The Colorado Department of Transportation hasn’t report an official road closure, but live camera images show traffic completely stopped. According to social media posts, Highway 6 is also at standstill.